Are you a new small business owner with big plans for growing your company in the future? There is no denying the many benefits of owning your own business. From the flexibility and freedom of not having to answer to a manager anymore to the income potential and life-changing experiences, it’s easy to see why more and more people are trying to launch their own small businesses. Unfortunately, though, small business does face a wide variety of challenges, especially when you’re just starting out. Simply put, there is no way around the hard work. As you review the benefits of starting a business, you will also inevitably run into talk of just how difficult it really can be to get your business off the ground. This is why it’s so important to compare startup ideas, knowing the decision you make for the direction of your business will impact you in many ways down the road. It doesn’t matter if your business is based on answering questions for money, providing people with a service, or manufacturing products, you should have a clear idea of the unique challenges that could potentially stand in your way. According to the Minority Business Development Agency, it takes an average of about $30k to start a small business. If this is all the money you need and you have access to the funds, such as in a savings account, you don’t have anything to worry about; however, this is not the case for a majority of entrepreneurs. If you need to seek outside funding, it can be much more difficult to find what you’re looking for. You can take out a small business loan, max out some credit cards, or even seek investors, but before you can explore your funding options you need to check your credit score to confirm you can successfully obtain a loan with favorable terms. According to CNN, there are approximately six million job openings in the United States. In other words, there is a lot of competition for top talent. This is a challenge you can’t afford to overlook. Neglecting to hire the best candidates and settling for whatever talent you can afford or attract could cost you a lot of time, money, and headache in the long run. It’s a challenge to find one good employee after the next, but just imagine how frustrating it will be to have to replace them frequently because they weren’t a good employment fit. Hiring is a big part of being a small business owner, and the employees you onboard will make a big difference in your business’s success. Anyone can create a basic marketing plan and hope for the best, but you don’t want to leave this part of your business to chance. According to Entrepreneur, there are five simple steps you can take to create a robust marketing plan to help you reach your goals. Once you have this in place, you’ll never have to guess how you’ll market your company to your audience. You’ll always know exactly what you should be doing. Nevertheless, remember you need to revisit your strategy at least once or twice a year, since your marketing plan should change and grow with your business. According to Market Watch, the average monthly rent for office space varies greatly based on location. For example, $1.74/square foot is average in Atlanta; however, as you make your way to the Big Apple, you can expect to pay more than $6/square foot. This is a challenge that almost every new business owner runs into if they are planning to operate a brick-and-mortar storefront. If you can’t find affordable office space, it may be time to consider a home office or even consider building an ecommerce business. As noted by the United States Department of Labor, the number of new jobs created by companies less than one year old has decreased over the past 20 years. Even so, these companies were still responsible for creating approximately three million jobs in 2015. That means competition is fierce in just about every industry, so you must prepare yourself for confronting how you’ll position your business to take the top spot over your competitors. These are not the only challenges facing a new small business owner, but they are definitely among the most common. If you prepare for these potential roadblocks in advance, you shouldn’t have any problem dealing with each and every one. 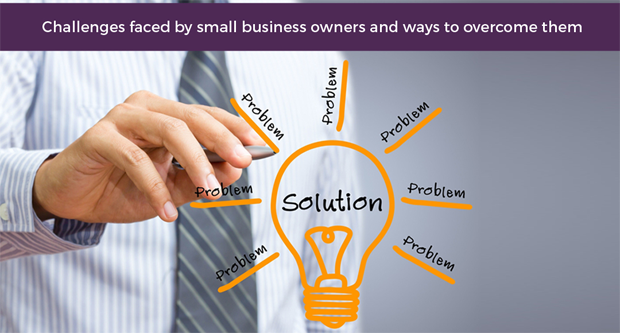 Do you have any experience dealing with one or more of these small business challenges? Were you able to find a solution? What steps are you taking today to avoid the same challenges down the road? Share your advice in the comment section below.